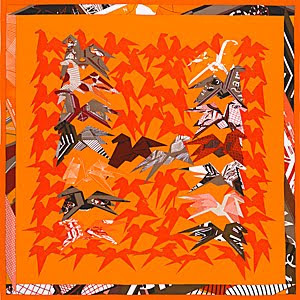 Today I will start the review of the Hermes Fall/Winter 2009 scarf collection with one of the most impactful scarf. My love and appreciation for Japan is captured in this marvellous design, depicting origami (folded paper) horses arranged to form a large "H". I find the orange perhaps a little too bright to wear (I am yet to see the scarf, this is a virtual rendition of the fall/winter 2009 collection), but this scarf, framed, would make a fantastic display. 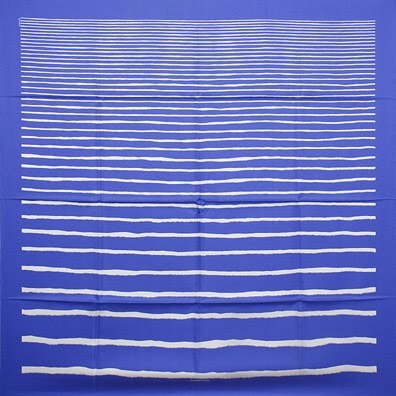 I cannot recall whether the previous "vintage-style" scarves (of which this one belongs, of 70cm x 70cm) were as "thin" as this one, but I must confess, I was really taken by how light and uncharacteristically Hermes this scarf is. Of interest is also the pattern along the scarf edges, where swatches of paper (or fabric), identical to the material used to make the origami horses, are in apparent disorder - the effect of this drawing approach is to infuse both balance and a sense of completeness into the design. Despite the surprising, "vintage" feel, I absolutely adore this pattern and I stand by my belief that this scarf shows beautifully both displayed and worn. 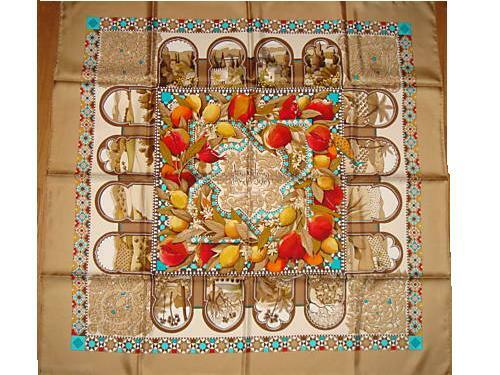 A true gem in the collection, this scarf, depicting "Les Jardins d'Andalousie" (Andalusian Gardens, by Aline Honoré) is as rich and as beautiful as the view of the Spanish landscapes (and a wonderful reflection of the Spanish culture). This scarf, featuring hues of dark gold and brown, puts into evidence - more than any other colour variations - the richness of harvests local to the area - lemons, pomegranates and jasmin. So I thought it best to mark the beginning of the Fall with a tribute to the hard work dedicated by countless people to the land. The design is superbly intricate, suggestive of the Maurish architecture (illustrated by the cloister arches). 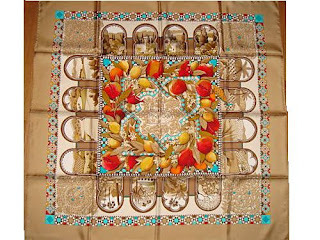 The middle, depicting the scarf's title laced in "stone", is surrounded by a blast of colour and life, similar to a the impression given by descovering a basket of ripe fruit in the fall, while the geometric border, in hues of red, green, yellow and turquoise, adds a playfulness reminiscent of children's play (or one's own childhood). A true visual feast, this design is undoubtedly the "crown jewel" of my collection. If I had to pick a single scarf as my all-time favourite, this would be it ! Collection SS2008: A vos crayons ! Traditionally in Romania, September 15th marks the beginning of the schools year (universities and colleges begin October 1st). So I thought it appropriate to mark the event that marks school children and parents alike with an playful design first issued in 2004/2005 and reissued in 2008, called "A vos crayons !" ("To Your Pencils!"). This scarf brings us back to the free-spirited (and worry-free) years of childhood when our imagination knew no limits. The focal point of this design is the pencil shavings scattered in the center, while colourful crayons, in an imperfect alignment, surround them all along the edges. The playfulness is further enhanced by the many colours of the crayons, and the fact that they are in apparent scatter, most pointing towards the middle while the rest are pointing away, towards the extremities. I love this design because the two elements balance each other very harmoniously - the geometric (albeit non-parallel) rigor of the pencils is graciously embellished by the apparent disarray of the shavings. I also find this design equally stirring due to its effect when the scarf is knotted. The most impactful is the cowboy knot - the scarf, folded in half diagonally, with the corner placed in front, while the sides wrap around the neck to tie in front as well - this way, the shavings are visible while the scarf edges bring further colour without overpowering the overall design or effect. The original Hermes ad is equally impactful, featuring a truly beautiful model whose piercing green eyes are complemented by the many colours in the crayons. Note the bolduc, which she holds with her white teeth, matching the pureness of the scarf's white background. 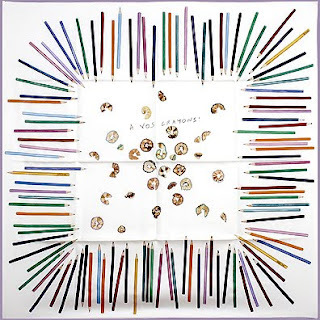 One similar design of this scarf, with the white background and taupe and sepia crayons with contrasting hem, sold recently for no less than USD655 on eBay - almost double its retail price of last year - setting a new record. 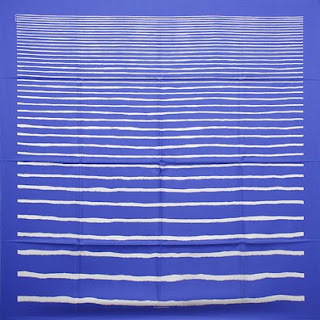 A friend of mine was wearing a sweater that resembled - and reminded me of - the Méditerranée scarf - a very stirring design that's beautiful in its simplicity. It features a more traditional patterned that, unlike many similar scarves, can become very contemporary when knotted in select ways. So while the first days of September continue to be bright enough to call it "late summer", it is also a time when the last leisure travelers enjoy some days on the Mediterranean shores (which, arguably, is an even better time to enjoy them as the crowds will have dissipated by now).